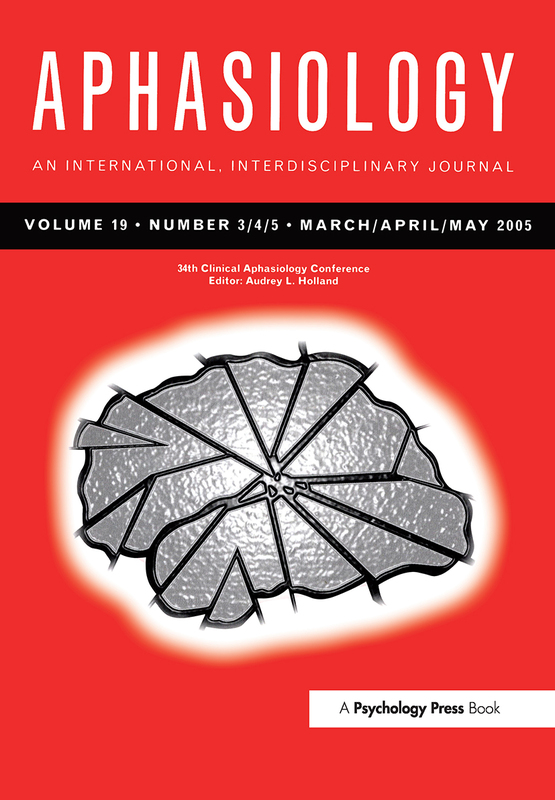 This special issue of Aphasiology represents the papers accepted for publication which were among those presented at the 34th Clinical Aphasiology Conference, held in Park City Utah in 2004. They have been peer-reviewed and selected by a distinguished group of ad-hoc editorial consultants from among the considerably larger number of papers and posters presented at the meeting itself. A.L. Holland, CAC Introduction. B.B. Shadden, Aphasia as Identity Theft: Theory and Practice. A.E. Hillis, M. Newhart, J. Heidler, E.B. Marsh, P. Barker, M. Degaonkar, The Neglected Role of the Right Hemisphere in Spatial Representation of Words for Reading. J. Fridriksson, L. Morrow, Cortical Activation and Language Task Difficulty in Aphasia. G.S. Olness, H.K. Ulatowska, C.M. Carpenter, L.J. Williams-Hubbard, J.C. Dykes, Holistic Assessment of Narrative Quality: A Social Validation Study. H.H. Wright, G.J. Capilouto, S.A. Wagovich, T.B. Cranfill, J.E. Davis, Development and Reliability of a Quantitative Measure of Adults' Narratives. C.A. Coelho, Direct Attention Training as a Treatment for Reading Impairment in Mild Aphasia. E. Armstrong, Expressing Opinions and Feelings in Aphasia: Linguistic Options. K.M. Youse, C.A. Coelho, J.L. Mozeiko, R. Feinn, Discourse Characteristics of Closed-Head Injured and Non-Brain Injured Adults Misclassified by Discriminant Function Analyses. S. Kiran, J. Tuchtenhagen, Imageability Effects in Normal Spanish/English Bilingual Adults and in Aphasia: Evidence From Naming to Definition and Semantic Priming Tasks. J. Reilly, N. Martin, M. Grossman, Verbal Learning in Semantic Dementia: Is Repetition Priming a Useful Strategy? S.A. Orjada, P.M. Beeson, Concurrent Treatment for Reading and Spelling in Aphasia. A.K. Melton, M.S. Bourgeois, Training Compensatory Memory Strategies Via the Telephone for Persons with TBI. J. Avent, S. Glista, S. Wallace, J. Jackson, J. Nishioka, W. Yip, Family Information Needs About Aphasia. M. Purdy, J. Hindenlang, Educating and Training Caregivers of Persons with Aphasia. E.M. Hickey, G. Rondeau, Social Validation in Aphasiology: Does Judges' Knowledge of Aphasiology Matter? J.P. Lasker, L.L. LaPointe, J.E. Kodras, Helping a Professor with Aphasia Resume Teaching Through Multimodal Approaches. R. Fucetola, F. Tucker, K. Blank, M. Corbetta, A Process for Translating Evidence-Based Aphasia Treatment into Clinical Practice. M.L. Blake, K.S. Lesniewicz, Contextual Bias and Predictive Inferencing in Adults with and with out Right Hemisphere Brain Damage. G. Youmans, A. Holland, M. L. Muñoz, M. Bourgeois, Script Training and Automaticity in Two Individuals with Aphasia. S. L. Schneider, R. A. Frens, Training Four-Syllable CV Patterns in Individuals with Acquired Apraxia of Speech: Theoretical Implications. M.R. McNeil, C.T. Matthews, W.D. Hula, P.J. Doyle, H.J. Rubinsky, T.R.D. Fossett, A Dual-Task Tool for Quantifying Normal Comprehension of Aphasic Connected Speech Production: A Constructive Replication.